In July 1997, the Los Angeles Unified School District considered an application by public school teacher Linda Smith to establish a new charter school. 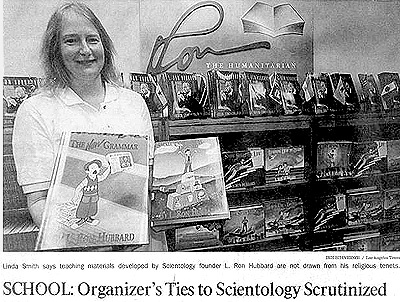 When questioned, Smith admitted that she and her two partners were Scientologists, and that the plans for their school included some unusual educational materials called “Study Technology.” This attracted the attention of the press and the story was broken by Duke Helfand of the Los Angeles Times in an article on July 27, 1997. Also that month, the California state Department of Education gave preliminary approval for five volumes in the Study Technology series to be used as supplemental textbooks, meaning they could be purchased with taxpayer funds and used by schools throughout the state. (See second Helfand article, LA Times, July 29, 1997.) The LA Times articles sparked an immediate controversy, as a result of which Linda Smith’s application was turned down and permission to use the Study Technology books as supplemental textbooks was withdrawn. A previous attempt to insinuate Study Tech into California’s public schools had been rebuffed 17 years ago for similar reasons (Myslinksi, 1980): public funds may not be used for religious instruction. The Californian controvery centered around the key issues of what Study Technology is and what it does. It is based on the teachings of the late L. Ron Hubbard, sometime science fiction writer and founder of the Church of Scientology, a reincarnation/psychotherapy group that many see as a cult. Its curious name reflects one of Hubbard’s most frequent quirks or marketing gimmicks: he would customarily label his religious doctrines as “technologies”. Study Technology, often abbreviated as “Study Tech”, forms part of a much larger body of Scientology scripture that members simply call “the tech”. The Study Tech books fall into two groups. The first three, the Basic Study Manual, Study Skills for Life, and Learning How to Learn, cover Study Technology proper, but are targeted at different grade levels. These three books are the primary focus of this essay. The remaining two titles, How to Use a Dictionary, and Grammar and Communication for Children, are unremarkable introductions to grammar and punctuation that show only a few tiny traces of Hubbard’s influence. The Study Technology is also used in other Scientology-related “social reform” programs, notably the Narconon and Criminon drug and criminal rehabilitation programs. There, it is delivered in the form of a “Learning Improvement Course” utilizing a very similar set of course materials. All five books (plus their Narconon and Criminon variants) are published by Bridge Publications, the in-house publishing arm of the Church of Scientology. They are distributed by a Los Angeles-based non-profit organization called Applied Scholastics International (ASI). ASI is a subordinate organization of the Association for Better Living and Education International (ABLE). This is in turn a subordinate, and an integral part, of the Church of Scientology, which exercises direct overall control of all of the aforementioned organizations. (Recently Scientology also began distributing the books through another front organization, Effective Education Publishing.) This complicated set of relationships, examined elsewhere on StudyTech.org, is seemingly designed to obscure the central role of the Church of Scientology in the promotion and implementation of Study Technology. This raises the question of whether the proponents of Study Technology are attempting to use public funds for covert religious instruction. The Study Technology’s supporters insist that the books are non-religious in nature.When the issue was raised in California, the Department of Education said that a committee that examined the Study Tech books could find no references to Scientology (Helfand, 1997b). It’s true that the word “Scientology” does not occur in any of these volumes. But Scientology jargon and religious beliefs appear throughout the three study skills books; they are inseparable from Study Tech. Study Tech is founded on three principles: (1) use pictures and diagrams to illustrate the concepts being taught, (2) break down complex concepts so they can be mastered in a series of simple steps, and (3) always seek definitions for unfamiliar terms. These rules make sense and are harmless enough when phrased in plain English. But the Study Tech books present them in a different manner. The three principles are called “mass”, “gradients”, and “misunderstoods”: terms that were invented or redefined by Hubbard and loaded with significance in the Scientology religion. These concepts are presented in a doctrinaire manner that is also characteristic of Scientology religious instruction. Study Tech actually helps lay the groundwork for introducing Scientology doctrines into secular education. The HCO Bulletins on Study Technology are also reprinted in various Scientology course packs, such as The Student Hat, that are sold as entry-level “religious services” (courses offered for a fee). A disclaimer at the front of each volume and each course pack, including those containing the Study Tech bulletins, states: “This book is part of the religious literature and works of the Scientology Founder, L. Ron Hubbard.” The Student Hat course is compulsory for all Scientologists. Before they can cross the Scientology “Bridge to Total Freedom”, they are required to “learn how to learn”. The same rule applies to all, no matter how literate they may be — a sign that something more is going on than mere learning. A summary of the “Barriers to Study” is also included in the Scientology Handbook. If one is studying about tractors, the printed page and the spoken word are no substitute for having an actual tractor there. Photographs or motion pictures are helpful because they represent a promise or hope of the mass of a tractor. If you are studying about tractors, words on a page or someone telling you about tractors is no substitute for having an actual tractor there. Photographs or motion pictures are helpful because they at least give the hope of the mass of a tractor. But reading books or listening to someone talk does not give you mass. (Learning How to Learn, p. 70). The mass of a subject refers to the parts of that subject which are composed of matter and energy and which exist in the material universe. In other words, mass is what can be visualized. But Hubbard’s pronouncement that learning cannot take place without visual aids goes too far. Must every sentence of every book be accompanied by a picture? Does a book on political theory, quantum physics, or the life of Shakespeare require a picture to illustrate each concept? Of course not. Hubbard’s Study Tech books claim that several “nonoptimum physical reactions” are associated with “absence of mass”. Such an absence of mass can actually make a student feel squashed. It can make him feel bent, sort of spinny, sort of dead, bored, and exasperated. When students experience these symptoms, they are immediately interpreted by Scientologist teachers as being the result of learning difficulties — a most dubious proposition. Hubbard was fond of making this sort of bold assertion, wholly unsupported or even opposed by hard evidence. We will return to the issue of Study Tech’s dubious physiological claims later. Gradient: a gradual approach to something, taken step by step, level by level, each step or level being, of itself, easily surmountable — so that, finally, quite complicated and difficult activities or high states of being can be achieved with relative ease. This principle is applied to both Scientology processing and training. There is nothing objectionable in the notion that complex ideas should be mastered by breaking them down into simpler steps done in a logical order. But Study Tech turns this sensible advice into rigid dogma, with a warning that violations can have unpleasant consequences. “If you have skipped a gradient you may feel a sort of confusion or reeling” (Learning How to Learn, p. 84.) The illustrations of this idea on pp. 84-85 show a boy who was trying to build a doghouse “seeing stars” as if he just got whacked in the head with one of the boards he was hammering. Within Scientology, the gradient doctrine is an important tool for controlling the flow of information. It discourages beginning students from looking too closely into Scientology’s claims. Students are told to accept things on trust and to wait until they are deemed ready for the facts. This is the bait used to attract many a new member. Scientology evidently takes the view — probably correctly — that its more esoteric beliefs, centering on hostile space aliens, would frighten off new members if mentioned early on. Adherents are instead inducted slowly into the secrets of Scientology, learning stage by stage through the use of Study Tech, following the “gradient” laid out for them by the Church. As was demonstrated by Monsieur Mangetout, the Frenchman who ate a bicycle, even a large indigestible mass can be consumed if it is eaten in bite-sized chunks. Being “out-gradient” is actually considered an ethical violation in Scientology, because it is “out-tech”, or contrary to Hubbard’s teachings about how one should study. But if a beginning student does encounter some of Hubbard’s more outlandish writings, the gradient concept offers a way for them to avoid acknowledging the absurdity. Consider two remarkable claims in Hubbard’s 1953 book Scientology: A History of Man: that human beings evolved from clams who were preyed upon by birds (p. 53), and that the spirits of most humans go to Mars for reprogramming when their bodies die (p. 116). Rather than trying to defend such improbable ideas when low-level Scientologists or members of the public ask about them, the response of Scientology officials is that History of Man is an “advanced” text — too steep a gradient for non-believers or beginning Scientologists to deal with — which conveniently rules out any possibility of debating the book on its merits. The questioner is then directed toward entry-level courses so that he or she can learn be properly conditioned before being exposed to this “advanced” material. For example, Scientology professes its compatability with and respect for other belief systems. The general public and novice Scientologists are told that Scientology is compatible with all other religions (see What is Scientology?, 1992 edition, p. 545), and the Church of Scientology often professes mutual respect when campaigning alongside faith groups. The picture from the far side of “The Bridge” is very different. Scientologists who have completed the Church’s highest-level and most secret courses will have learned from Hubbard that God was essentially an evil “Big Thetan” presiding over a deserted and run-down heaven, that Christianity was “implanted” by a race of alien invaders 2,000 years ago, that the Ka’aba in Mecca was the unconscious imitation by the Prophet Mohammed of an alien implant mechanism called the “Emanator”, and that Hinduism’s doctrines are “very treacherous” (Hubbard, “Heaven,” HCO Bulletin of 11 May 1963; “Assists,” Class VIII Course lecture #10; “Philadelphia Doctorate Course lecture #14″). The third principle of Study Tech centers on the concept of misunderstood words. They’re called “misunderstoods” in the books, and abbreviated as M/U or Mis-U in Scientology. Misunderstoods can be “cleared” by looking up the word in a dictionary. This is fine as far as it goes; students should certainly learn to use a dictionary. But according to Hubbard, misunderstood words are not a minor problem; they are in fact “the most important barrier to study” (Learning How to Learn, p. 101; Basic Study Manual, p. 49), and “the only reason a person would stop studying or get confused or not be able to learn” (Learning How to Learn, p. 114; Basic Study Manual, preface). In fact, “THE ONLY REASON A PERSON GIVES UP A STUDY OR BECOMES CONFUSED OR UNABLE TO LEARN IS BECAUSE HE HAS GONE PAST A WORD THAT WAS NOT UNDERSTOOD” (How to Use a Dictionary, p. 282; capitalization as in the original.) This sentence also appears in the frontmatter of all Scientology religious volumes. According to the Study Tech materials, a single misunderstood word can cause a person to not remember anything on the page they just read, or make them want to stop studying the subject altogether (Learning How to Learn, p. 116; Basic Study Manual, pp. 58-59). The books also teach that misunderstood words cause physical symptoms: feeling blank, tired, worried, upset, “like you are not there”, or suffering “a sort of nervous hysteria” (Learning How to Learn, pp. 110-112; Basic Study Manual, pp. 50-52.) The reason for these symptoms is not explained but the answer lies in other Scientology doctrines not included in the “secularized” version of Study Tech (more on this later). Hubbard’s obsession with misunderstood words leads to a number of uniquely Scientological practices, such as a fondness for dictionaries. Several large dictionaries are found in all Scientology churches. Hubbard’s religious writings forbid the use of pocket dictionaries, which he dubbed “dinky dictionaries”, because of the inferior quality of their definitions (HCO Bulletin of 19 June 1972 revised 3 June 1986, “Dinky Dictionaries”, and HCO Bulletin of 13 February 1981, revised 25 July 1987, “Dictionaries”.) Scientology also publishes several dictionaries of its own extensive jargon, including the Basic Dictionary of Dianetics and Scientology, the much more comprehensive Dianetics and Scientology Technical Dictionary (known as the “tech dictionary”), and Modern Management Technology Defined: Hubbard Dictionary of Administration and Management (the “admin dictionary”). As many as 3,000 terms, many of them being neologisms coined by Hubbard himself, are said to be defined in the Scientology dictionaries. Yawning may occur for reasons quite unrelated to the task at hand. Even now, scientists do not know for certain why humans and animals yawn, demonstrating the arbitrary and unscientific nature of Hubbard’s insistence that “misunderstoods” are the root cause. And there are many other factors besides misunderstood words that can cause lack of comprehension. The material itself could have problems. Bad grammar, faulty logic, disorganized exposition, and obviously false factual statements are examples. Why place all the emphasis on just one possible source of confusion? Study Tech thus provides a convenient blame mechanism. If a concept is not understood, it is always the fault of the student, never the fault of the teacher or source material. Study Tech’s focus on misunderstood words is not just some arbitrary bit of educational dogma. It is an intentional and effective device for suppressing critical thought. In effect, it atomizes language, divorcing words from concepts. The same words might appear in a Shakespearean sonnet or an L. Ron Hubbard bulletin but their collective meaning might be very different. The words themselves may be perfectly comprehensible but their meaning may not be. The context is stripped away, leaving the words to be studied in isolation. But a student cannot ascertain context from isolated words, any more than she could ascertain the design of a house from individual bricks. The most outlandish concepts can thereby be presented in a way that compels word-by-word acceptance. The fundamental tenet of Hubbard’s “study tech” is that ANY disagreement with the subject matter being studied, ANY inability to apply the materials, and any non-comprehension of the materials stems ONLY from “misunderstood words” in the “Source” materials. With this mechanism, Hubbard made his “source” materials infalliable. In the Scientology “study tech” mindset, there can be NO dissent with Hubbard’s utterances and ANY difficulty the student is having with the subject or the organization stems ONLY from misunderstood words he went past. Using Hubbard’s notion of the “misunderstood word”, one could introduce a “Source” textbook on geology, written by the President of the Flat Earth Society and have every student who disagreed with the materials look up all the “misunderstood words” they went past, until harmony with the Source material was in place. Harrington’s characterization seems accurate. When one of us (DST) asked Heidrun Beer, at the time a devoted Scientologist, what she would do if she found a Hubbard policy she could not agree with, her reply was: “I’d go back and find my misunderstood word.” Beer has since broken with the Church. Worse still, it is implied that misunderstanding (and by extension, disagreement) is the root cause of anti-social behavior and illness. The Basic Study Manual claims that a student trapped in an M/U will go out and “commit harmful acts against the more general area.” (This is accompanied by a picture of a student vandalizing a restroom). “This is followed by various mental and physical conditions and by various complaints, faultfinding and look-what-you-did-to-me” (Basic Study Manual). Disagreement and incomprehension is thus equated with anti-social behavior. This equation is not unique to Scientology or indeed to religion; it is a common aspect of many authoritarian societies, where failure to conform to the approved ideology is commonly attributed to the dissident being “anti-social”. Scientology is an unusually authoritarian belief system. Hubbard prohibited absolutely any deviation from his ideological standards and severely punished any attempts to alter or build on his work. Much of the extensive list of disciplinary offences listed in his rigorous system of “Scientology Ethics” relates to ideological deviation or dissension, banning both completely. This means that, unlike mainstream belief systems, Scientology has an absolute prohibition on critical interpretation (exegesis) of its core texts; it calls such expression “verbal tech”. There are no Scientology theologians save the now deceased Hubbard, nor can there be — it is an authoritarian, ideologically rigid and ultimately intellectually sterile philosophy. Study Tech reinforces Hubbard’s demand that his idea not be re-interpreted, or even debated. He explicitly puts the emphasis on rote learning — or “duplication” in Scientology jargon — rather than critical interpretation: “A misunderstood word keeps a person from duplicating what the written materials actually say” (Hubbard, “Method 9 Word Clearing The Right Way,” HCO Bulletin of 30 January 1973 revised 19 December 1979). There is no field in all the society where false data is not rampant. “Experts,” “advisers,” “friends,” “families,” seldom go and look at the basic texts on subjects, even when these are known to exist, but indulge in all manner of interpretations and even outright lies to seem wise or expert. Where a subject, such as art, contains innumerable authorities and voluminous opinions you may find that any and all textbooks under that heading reek with false data. The validity of texts is an important factor in study. Therefore it is important that any Supervisor or teacher seeking to strip off false data must utilize basic workable texts. These are most often found to have been written by the original discoverer of the subject and when in doubt, avoid texts which are interpretations of somebody else’s work. In short, choose only textual material which is closest to the basic facts of the subject and avoid those which embroider upon them. Man’s texts and education systems are strewn with false data. These false data effectively block someone’s understanding of the true data. The handling given in this HCOB/PL makes it possible to remove that block and enable people to learn data so they can apply it. A strict Hubbardian line on “false data stripping” would cut a swathe through learning. Anything that contradicted the theories of L. Ron Hubbard, or was singled out by him for condemnation, would automatically be regarded as “false.” This would include anything to do with psychiatry and psychology, much medical knowledge, anything to do with evolution (“man from mud theory” as Hubbard put it), cosmology, atomic physics, economics, educational methods, aspects of biology and so on. In short, it is very much like the sort of line that a conservative religious fundamentalist concerned with Biblical purity would take; creationists also try to get schools to engage in “false data stripping” by dropping or downplaying evolutionary theory. In denigrating the usefulness of derivative works, Hubbard overlooks or ignores the fact that knowledge does not simply appear from nowhere. There are surprisingly few completely original discoveries. Virtually every aspect of knowledge is developed over time by re-examining and building on the work of others. As Sir Isaac Newton, himself no slouch at discovery, once said, “If I have seen further, it is by standing on the shoulders of giants.” If Hubbard had been more self-reflective or honest he would have acknowledged that he too owed considerable debts to intellectual predecessors. The Study Tech, for instance, owes much to the ideas of Alfred Korzybyski. In the early days of Scientology, Hubbard credited him along with an eclectic variety of other sages. But by the time the contents of the Basic Study Manual were written, Hubbard had decided that Scientology was entirely the fruit of his own inspiration and owed nothing significant to anyone else. His hostility to critical analysis and development was a notable illustration of his authoritarian and dogmatic approach to knowledge. The remedy for misunderstood words is “word clearing”. Study Skills for Life (pp. 66-74) includes a simplified treatment of word clearing, using a six-step procedure that begins with looking up the word in a dictionary and using each of its definitions in several example sentences. The student then reviews the derivation of the word, and studies any idioms associated with it. Finally he reviews any additional information provided in the dictionary, such as usage notes or synonyms. The more comprehensive Basic Study Manual describes three separate techniques for “word clearing”. They are called Method 3, Method 9, and Method 7, in that peculiar order. Method 3 Word Clearing is to be used when the student is showing a lack of enthusiasm, is yawning, doodling, daydreaming, or otherwise failing to make progress. The student is instructed to go back over the material he’s been reading until he finds the misunderstood word. (Basic Study Manual, p. 155). Good Word Clearing is a system of backtracking. You have to look earlier than the point where the student became dull or confused and you’ll find that there’s a word that he doesn’t understand somewhere before the trouble started. If he doesn’t brighten up when the word is found and cleared, there will be a misunderstood word even before that one. No doubts about the effectiveness of Hubbard’s methods are permitted. One must simply apply them until they work. In the second approach, Method 9 Word Clearing, the student reads aloud to a partner, the “word clearer”, who watches for stumbling points. Any hesitation, mispronunciation, or fidgeting is taken as evidence of a misunderstood word. The word clearer must interrupt the student and get him to go back and find this word, which is then cleared by looking it up in a dictionary, verbally paraphrasing each of the definitions to the word clearer, and then using the word in several sentences. In an example given in the Basic Study Manual (pp. 188-195), the student reads “The quick brown fox jumped over the lazy fence”, but the last word was supposed to be “dog”. The word clearer points out the error, and the student goes back and discovers that it is the word “lazy” that she does not understand. After reviewing the dictionary definition, she is able to read the sentence correctly. Later, the two persons switch roles, and when the former word clearer (now in the role of student) reads the same sentence, it comes out “The quick brown fox jumpled…” This mispronunciation is caught and discovered to be due to a lack of understanding of the word “quick”, so the dictionary is brought out again. It’s hard to take these idiotic examples seriously, or imagine anyone wanting to subject themselves to such a tedious procedure every time they yawn or make a slip of the tongue. But this is what Scientology says one must do to overcome “the most important barrier to study”. And this is what the Study Tech books teach. Method 7 Word Clearing is intended for “children, foreign language persons, or semiliterates” (Basic Study Manual, p. 199), and also involves reading aloud. The word clearer follows along in his own copy of the text, and checks for omitted or misread words, hesitations, or frowns. When one of these signs occurs, the word clearer identifies the misunderstood word and looks it up for the student in a dictionary, or simply explains it to him. Method 7 is intended to be used when the student lacks the ability to look up words for himself. The origin of this peculiar numbering system is revealed in the section of this essay entitled “Word Clearing as Religious Ritual”. All three Study Tech books also include sections on “demo kits” and “clay tables” as a means of “getting the mass” of the ideas the student is studying. A demo kit is a collection of odds and ends, such as rubber bands, paperclips, corks, pen tops, thumbtacks, erasers, etc. The student is supposed to “demo” a concept by choosing several objects, assigning them significance, and verbalizing or physically demonstrating the relationships between them. The key represents the student and he is reading a page which is this rubber band, and he goes past a misunderstood word, shown by a paper clip. When he gets here to the bottom of the page, he will feel blank because of the misunderstood word he didn’t look up. Right! That makes sense! If this is the best example they can come up with, then the utility of demo kits is a dubious proposition at best. The clay table is a more elaborate model-making practice, unique to Scientology. Once again, the instructions for this activity come directly from Scientology scripture, such as HCO Bulletin 11 October 1967, “Clay Table Training”. Students construct a “clay demo” of a concept by modeling its components in clay and assigning a paper label to each. The instructor is supposed to be able to infer the concept by viewing the completed clay demo scene. An example given in the Study Tech books is a clay demo of a pencil: the labeled parts are a thin cylinder with a point on one end labeled “lead”, another cylinder wapped around it labeled “wood”, and a blob at the end opposite the point labeled “rubber”. The books go on to show how thoughts can be represented in clay. One makes a human figure (with a label saying “person”), and then makes a sort of clay lariat coming out of its head. The loop of the lariat lies on the table, and within the loop one puts a model of the thing being thought about. For example, a person thinking of a ball would be modeled as a human figure labeled “person”, a lariat labeled “thought” coming out of its head, and a ball of clay labeled “ball” sitting within the loop of the lariat (Basic Study Manual, p. 145; Study Skills for Life, p. 92). Clay Table Processing is an AUDITED action and is done per the rules of auditing and is always done with an auditor or student auditor or Supervisor standing right there running the process on the person. Whether religious or not, the use of a clay table is a clearly a simple-minded approach to understanding abstract concepts. Rather than promoting understanding, it seems much more likely that clay tables work — assuming that they work at all — as a visual memory aid. For instance, when discussing the composition of a water molecule, one could either describe it verbally as “two hydrogen atoms attached to one oxygen atom” or visually as two similarly-colored blobs of Play-Doh stuck onto one differently-colored blob. Humans are naturally very visually-oriented creatures — we had art long before we had writing — so it is not surprising that we often find images easier to recall than words. That is fine if the only goal is the accurate recitation of rote-learned facts. This is, in fact, the only goal that Hubbard was interested in with his Scientology students. But it is useless in developing the critical skills that are so necessary in the non-Scientology world, and that Hubbard was so conspicuously uninterested in encouraging. Where can I get these books, thank you? You need to read Hayakawa’s work in General Semantics and Alfred Korzybski’s General Semantics where the “Study Tech was filched from without due credit by the Hubbard. For Korzybski, people do not have access to direct knowledge of reality; rather they have access to perceptions and to a set of beliefs which human society has confused with direct knowledge of reality. To embody this insight, Korzybski is remembered as the author of the dictum: “The map is not the territory”. I completed this course. (BSM). It is 100 % true, understandable, useable. It is the TRUTH about learning, it contains everything theoretically, and practically in the theme. – that is, how your mind works in the field of studying, why, and what you can do to be able to understand, what you learn, and use it in practice, what you learn. PERFECT ! – I know, what I am speaking about, because I did this course, so I don’t care of outsiders opinions. And BSM is for everybody, because the mind works exactly the same way in everybody. And there aren’t “but”s, and there aren’t “other thing”s, because it is so absolute, that there is no need to take away any information from it, or to give extra information to it. The mind does NOT work the same for everyone. Go away with your obvious propaganda. I agree with you. People who have not completed the BSM course are not reliable critics and are just gunning for the COS as a cult, which I agree it is just as much a “Freedom Factory” as any other institutionalized religion. There are though some “goodies” to be had within the organization, and now outside of the organization, where I reside. But good study tech can be developed to improve the current educational system and I suppose that discussion belongs on another forum. Not a good idea to have any commerce with the CofS. Children should be instructed on how to use dictionaries at a young age, and are they? The reason you see any reach at all for CofS educational materials is because of the degraded state of state-run education. I am glad this website speaks derogatorily about CofS and the “carrots” that they offer — with the “stick” not far behind. I have done all the study courses, BSM and Student Hat. I must say, Student Hat did go on a bit unnecessarily for the most part but BSM was great. I’m not a Scientologist – was one. I can see what the author is implying in his article and to that degree, I agree. can study and read at a phenomenal rate. I don’t apply using demos very much, hate clay demos and never use them and clear up words not as thoroughly as I should. However, I can vouch for having this knowledge about how to study. I’ve seen yawns disappear as soon as the student starts to clear up a word. This is totally true. I’m not saying it’s the only reason one yawns. I yawn when it’s meal time. I also yawn when I’m protesting something – I’m being patronised or sitting through something again that I already know. I can go past words I don’t understand a lot of the time and in the course room, I learnt how not to move or blink or do anything that would get the course room supervisor insisting I find the misunderstood word. One learns to fake and the necessity to act sincere when now. Good that you separated the wheat from the chaff. I applaud you. WOW – these books seem excellent! Thanks! Where can I buy them bulk? I am very confused to what piont your articals are tring to make. Reading the artaical on study tech seen to me to be common sence , but for the fact that the artacal is peperd with innungs and inplication which totaly spoilt it. So how about we come clean and tell me what point are you trying to make. The point is that these books should not be used to teach anyone anything. The BSM course I took was well delivered and of benefit to me to help take me to the next step of being able to understand texts that I could not understand previously. Even when I study the work of beings who have ceased with games conditions, I am grateful for the basics instilled in me with the help of the BSM course and hours of supervised study. The supervisors or teachers never inserted their own personalities and gave me the right balance of freedom and discipline, as a newbie on the path to Nirvana (means “cessation of thought driven action”). Thank you to my courseroom supervisors. DISCLAIMER: I DO NOT PRACTICE THE GROUP OF BELIEFS AND PRACTICES KNOWN AS SCIENTOLOGY, NOR AM I AFFILIATED WITH PRACTITIONERS THEREOF. I’ve used the BSM (or, more accurately, some of Hubbard’s study tapes). Some of the stuff is actually useful and helped me in my work, but tends to be a bit heavy-handed and rigid (for instance, “always” instead of “we suggest”, etc.). I believe Hubbard was wrong about the physical reactions, and I do believe the work was dogmatically motivated, but the fact remains that portions of the work have worked for me and I do believe they may work for others also. In fact, I wrote a short treatment of the subject, with little bits and pieces taken from various sources, including Hubbard, and this has worked for me so far. I also neglected to mention that Study Tech-based teaching methods (I do not recommend absolute adherence to it) are subject-dependent. It applies well to the humanities—literature, sociology, anthropology, and psychology are very well served by Study Tech (my psych teacher, at my recommendation, used it in her classroom and the students learned better) but science and especially mathematics are not compatible. For better or for worse, there remains the fact some former adherents to Scientology have expressed similar thoughts. Mathematicians are always doing demos, aren’t they, lol! Whatever circumstances led you into the arms of the CofS, if that is where you took your BSM course — well, I’m glad you profited from the experience. Overall I would say my experience with Scientology was a major milestone in my further understanding of and interest in the human mind and what it would take to — as the Zen Buddhists say — quiet the mind. That led me to the Sedona Method Course, and then into the theory and practices of Dennis H. Stephens’ “The Resolution of the Mind, a Games Manual”. Occam’s razor applies here for results and simplicity. Never been linked to CoS. I read the books and applied the methods suggested in the tape. That’s it. Good to hear. I know a few people like that. No educational methodology should ever squelch dissent or discourage students from asking questions. And no educational text should ever be off-limits from discussion or immune from critique. It’s obvious to me that scientology is just trying to shield itself from critique because any half-brained moron who looks at it would immediately see how crazy it is. How so? Look, can you post in a way that gives me some idea of what you are talking about? To be specific what is the “crazy” part? Do you want me to react emotionally along your lines or do you want me to analytically decide based on the specific data you present? Scn is wholly separable from Study Tech. I’m not a Scnist but use Study Tech in the practice of law. It’s that simple. Hodor, I bet you believe everything you read. Sorry but Hubbard does mention and give credit to them, Obviously if you didn’t read it it doesn’t exist, that’s being kind of small minded on your part. Here’s my take on study tech.